To Celebrate the opening anniversary of "Little Mermaid: Ariel's Undersea Adventure"
MAY. 20. 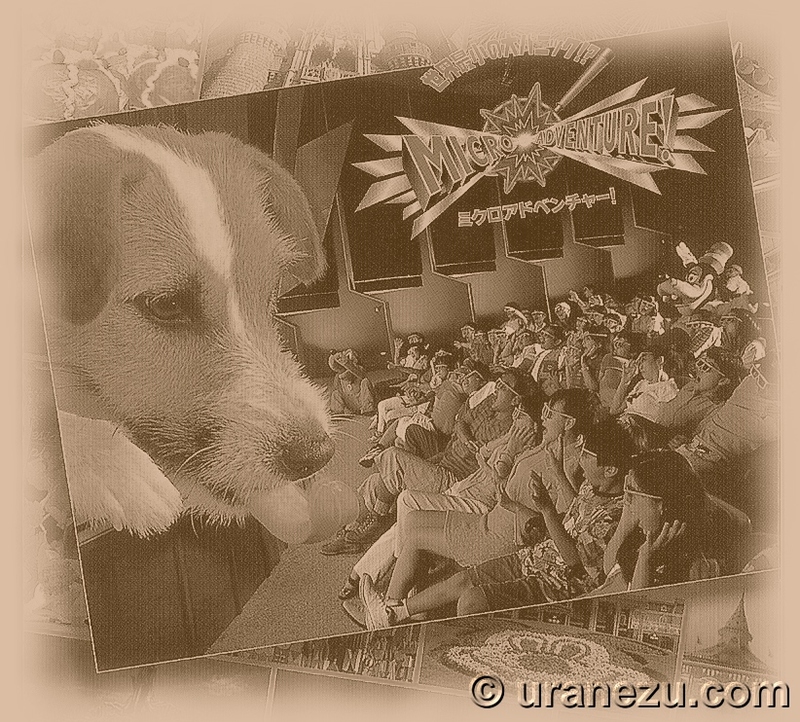 2011 about the "Captain EO" and the "Honey, I Shrunk the Audience!" "Welcome back!" and "Suddenly farewell"
APR. 29. 2011 about the Disney's Easter Wonderland. APR. 15. 2011 about The Opening Day of "Cinderella's Fairy Tale Hall"
APR. 15. 2011 We Go Forward. On 3. JUL, new dark ride attraction, "The Little Mermaid: Ariel's Undersea Adventure" will open at Paradise Pier in Disney California Adventure. I envy you. I hope to go to America again, and ride the attraction soon. Have you ever wanted to explore the inside of the dark ride attraction by foot? In Mermaid Lagoon at TDS, you can walk through the under sea world same as the Ariel's Undersea Adventure. Please come and visit TDS! The wonderful cave passageway to the Triton's Kingdom. When you walk through the passage you can hear a harmonious bubbling water sounds. The view from bottom of the sea, there are amazing ocean surface ceiling. There are a coral lounge which Ariel lied on it and sat on it during Sebastian's big moment, the "Under the Sea". In some under the sea place, you can find the floating boat. We can imagine the sweet scene of "Kiss the Girl" from this view. When you get hungry, you can visit the colorful ocean floor restaurant, it's "Sebastian's Calypso Kitchen". You can find Flounder and friend fishes who set the mood for the Ariel's date at the merchandise shop. It was named "Kiss de Girl". Nearly 11 months had passed since reopened the "Captain EO" on JUL. 1. 2010. OLC officially announced that the "Captain EO" will become a regular attraction before the 30.JUN.2011 which was the initially closing date of the attraction. And with this change, the previous attraction, "MicroAdventure!" (TDL name of the "Honey, I Shrunk the Audience!".) will be closed permanently. The reason is, OLC said, "-which is widely acclaimed for its sophisticated performance, high level of visual technology, and fantastic special effects, in addition to the popularity of Michael Jackson- has continued to attract guests of all ages. And now, it has been made into a regular attraction to enable even more guest to continue enjoying Captain EO.". Of course, the above OLC announcement is the big reason to become a regular attraction instead of the "MicroAdventure! ", however, I think there are some reasons. The sharply lower earnings after the earthquake would be very difficult to reset to the "MicroAdventure!" which would probably be a part of the reason. It goes back a year, when the news of the "Captain EO" back to TDL had spread, many "MicroAdventure!" geeks were deeply concerned about the possibilities whether the attraction could come back properly after the end of the period of "Captain EO", despite the official OLC announcement that the "Captain EO" is one-year attraction. The worst expected for the "MicroAdventure!" geeks became a reality. I can't wholeheartedly welcome of the returning of the "Captain EO" under this painful situation for them. The sudden changing deprive them of a chance to record the everything of the "MicroAdventure!" for example, the marquee, pre-show, and so on. If I were a "MicroAdventure!" geek, I writhe in agony. I really hope OLC respond in some form to the "MicroAdventure!" geeks. And I also want OLC step up its merchandise of the "Captain EO". There are only six items at the tiny corner, poster, postcard, T-shirt, button, key chain , and two plushies. All items are same design of the main art of the "Captain EO". Sadly, these Fuzzball and Hooter plushie just brought from America's merchandise. No rainbow T-shirt same as EO, no sequined Micky gloves, there are no original Captain EO merchandise in TDL. 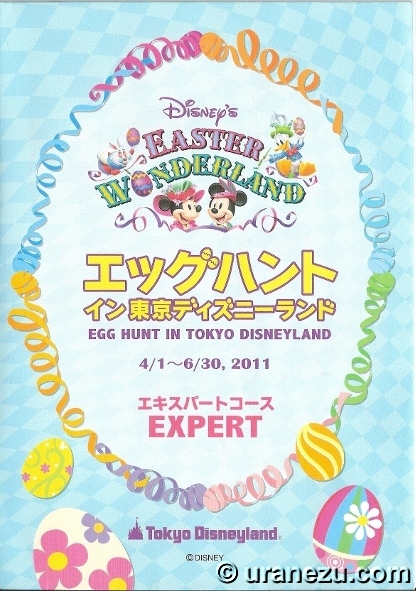 During the "Disney's Easter Wonderland", we can enjoy the Egg Hunts in TDL. The event was very popular when it was first held last year. In this year, there are 2 type courses, Standard (¥ 500 yen) and Expert (¥ 1000 yen). The blow is the Standard Course's present. There are 7 different characters. The eggshell with decoration stickers. The blow is the Expert Course's present. The design will be changed by every month. From a lovableness of the searching eggs and the present, I strongly recommend you the Standard Course. Anyway, the eggs in TDL are very adorable and fun to see, so enjoy them! During this season, the statues of the seven dwarfs at the Snow White Well are replaced by them. Pixars! The details of the tow hook of Mater is nice. Mickey & Pals! The Mickey & Minnie eggs are pretty behind. Disney Classics! Awesome meatballs spaghetti! 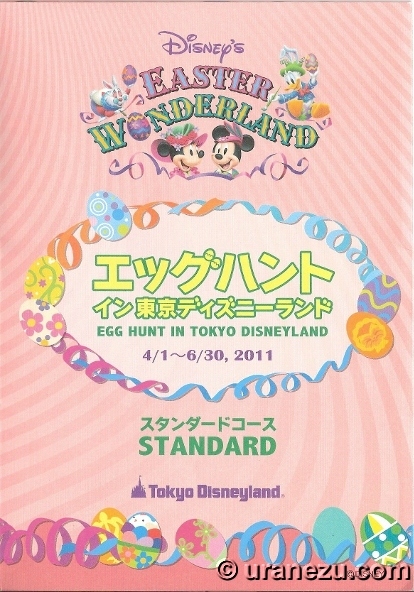 Disney's Easter Wonderland will last until the end of June, therefore you can enjoy the egg hunts in TDL until 30. JUN. If you want to know the rules of this Egg Hunts in TDL, please email me. The spring event "Disney's Easter Wonderland" has come again! A cheerful parade starring various changes Mickey, a pretty Easter bonnet, and an adorable egg-shaped merchandises, everything about the event in last year had welcomed by many guests. For most of the Japanese people, of course includes me, brought in a foreign cultures to our lives in Japanese way, such as Christmas, Valentine, Halloween, and so on. Therefore the Easter also is going to become popular event in Japan. Anyway, this event seems to have been successful, and in this year, the event come back to the park more powerful. Here are the some pictures from photo locations. In World Bazaar, at "The Disney Ga rally", there are Disney character drawing classes (Japanese language only) for a fee. During the Easter event, "Miss Bunny" class has started. After the class, you can bring your drawing with the original Miss Bunny plastic case. Why don't you try it? The fee is ¥500 yen per person for 30 minutes class. For this event, there are two patterns, Micky Mouse and Minnie Mouse egg-shaped popcorn buckets have launched in TDL. Each of the bucket is ¥1500 yen includes the strap. 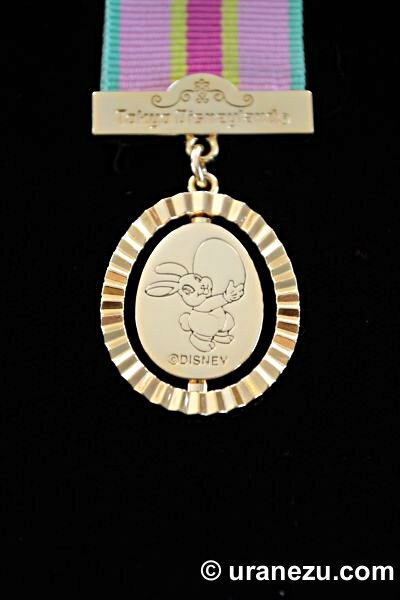 The "Disney's Easter Wonderland" event pin. The main of the show is a Sorcerer's Hat Barge to be a main stage and also a main screen with full of LED. There are no fixed stages on the Harbor which appears the character. The character appear the top of the Sorcerer's Hat Barge. There is only one water screen system of TDS' Fantasmic! The water screen set at the back of the Sorcerer's Hat Barge and not use as the curtain for quick scene changes. It use as an effective backdrop is a big difference from other Fantasmic. Also during the show, four Air Balloon Screen Barges come out. Three character Barges, Kaa and fire-breathing dragon also show up. The contrast between the vivid main LED and soft texture of the water screen is fascinating. No catchy intro with the synchronized lighting of the show beginning. No teleportation from one stage to another, so the end of the show is lackluster. The LED main screen is very clear and vivid to see from a distance. It is very beautiful. The real Magic Mirror Frame and the variety of the villains on the water screen combination are awesome. During the villains scene, the Sorcerer's Hat Barge is shrink to transform as a cauldron with an intense flame is very unique. After the show, I really would like to see the Fantasmic! at WDW or DL, however the Fantasmic! at TDS is successful as a subspecies of Fantasmic! First, the romantic decor elevator take the guest to the up floor. The bright sunshine shines in through the panned window gives you a very romantic atmosphere. There are many paintings of Cinderella's story and art works. Here are the most popular photo spot. Most wonderful experience of the attraction, you can try the glass slipper on! I think that the slipper is just mock to entertain the guest which was arranged by Cinderella herself. There are a sparkling glass slipper is displayed in a showcase. This glass slipper seemed to left the Fairy Godmather's magic, because the slipper in the showcase is glittering sometimes. On the same day, 15. APR. 2011, the merchandise shop, "Kingdom Treasure" opened. Knight Mickey and dragon seem to be in good spirits and the dragon was bewitched by Queen Minnie's beauty are nice paintings. The store once had existed as "The AristoCats" since the park opening. This previous store closed on 10. JAN. 2011. The store had nothing special about AristoCats, no AristoCats items, and theme. However, during the Halloween season, there were some jack-o-lantern which curved "O'Malley" & "Duchess" was beautiful. Here are the some photos previous store and current ones. Today, on 15. APR. 2011, TDL reopened. OLC announced that the operation hours 8a.m to 6p.m. for the time being at least. The below is the silent information in TDL. 2011/5/9-6/16 Monsters, Inc. Ride & Go Seek! 2011/9/1-9/14 The Enchanted Tiki Room: Stitch Presents "Aloha E Komo Mai!" "Big Thunder Mountain" is still under repair caused by the earthquake. The below restaurants schedule of the reopen is still up in the air. However, the entrance of the above two restaurants opened as a character greeting area. On 15. APR, I checked Lilo at the "Polynesian Terrace Restaurant", and Woody, Jessie, and Bullseye at the "Slue Foot Sue's Diamond Horseshoe". 2011 Ambassador, Ms. Tomoko Baba's big smile and beautiful cherry blossom cheered up the guest. Many cast wear the blue wristband in TDL. It is a charity wristbands, and same one will be sold on 22. APR. to the guest. This is a donation as relief money to the Japanese Red Cross ￥300- per guest and the proceeds from the sale. About a month have passed since the earthquake in Japan. The deep sorrow never clear off completely, however I believe that the accumulation of a small joy ease your sorrow. TDR is still closing. It expected to reopen will be in May or after May due to the planned power outage. The topic that I'm going to introduce was written on 6-7. MAR., before the earthquake. Just when I had posted this topic on my website, the earthquake happened on 11. MAR. Therefore the topic was put on hold. The all schedule of the new event, attraction, show in TDR is suspension or unclear, however in the event of the reopening, these things will be carried out gradually. Therefore the topic post on my site. The pictures on this topic were taken before the 11. MAR.earthquake. As we stand at the 10th anniversary of the TDS, so many new things, include new attraction, new greeting spot, new show, and the new shop will waiting for you. Now in this off season, there are many fences and cover which surroundings the coming new facility. Oriental Land Co., Ltd. officially announced the TDS 10th anniversary event is "Be Magical!" will start on 23. APR. 2011. Strictly speaking, the 10th anniversary of TDS is 4. SEP. 2011. However, TDL become 28the anniversary coming on 15. APR. 2011., and new walk through type attraction will be open on the day. In addition to, in TDL, the spring event "Disney's Easter Wonderland" will come back on 1. APR. 2011. which won the great popularity in last years. Therefore the OLC may bring forward the date of the TDS 10th anniversary event. Anyway, let's start introducing what is coming to the parks. These pictures from the Mediterranean Harbor under construction for the "Fantasmic! ", 19. NOV. 2010. It was an amazing experience that I could take a picture within the one frame such as a crane in the construction site in the midst of the harbor and the Transit Steamer or the gondola, 27. NOV. 2010. Another harbor construction photos, 13. DEC. 2010. The harbor construction continued for about a month. Now the construction was completed. OLC announced that The nighttime entertainment show "Fantasmic!" themed an imagination of Mickey Mouse as the Sorcere's Apprentice takes place the Mediterranean Harbor. And also announced that the show include a spectacular scene with the character from "Aladdin", "Cinderella", and "Finding Nemo", and has 27 characters include Mickey Mouse, Minnie Mouse, Cinderella, Stitch. Location : Mediterranean Harbor in TDS. Performance Time : 20 minutes, 1-2 performances per day. Number of Performers : 45 people. Hosted by NTT DOCOMO, INC. The picture from "Dockside Stage" before the S.S. Columbia. This improvement for the new stage show "A Table is Waiting". The boisterous review show which Mickey Mouse after his world cruise, bring and show the host Lumiere from "Beauty and the Beast" a various souvenir from all over the world. Featuring Mickey Mouse, Minnie Mouse, Donald Duck, Daisy Duck, Pluto, Goofy, Chip & Dale, and Lumiere. This show revised the same title show which has been performed during the "Disney a la carte" the event in 2008. Mickey Mouse and Minnie Mouse will be appear with a new costume. Location : Dockside Stage, American Waterfront in TDS. Performance Time : 30 minutes, 5 performances per day. Number of Performers : 30 performers. These areas are waiting for a new greeting spot, the "Mickey & Friends Greeting Trail". This area near the "Indiana Jones Adventure: Temple of the Crystal Skull" the attraction where used to be a quite place surroundings many beautiful vegetation as though lost in a tropic jungle. There are many benches along the trail was very comfortable to escape the hustle and bustle of the park. The guest enjoy the meet and greet the character who are surveying of the ruins, plants, instincts at the "Mickey & Friends Greeting Trail". The each character waiting for you in the different buildings, and there are the various gimmicks in the queue to the each buildings which feel like an explorer or an adventurer. The gimmicks such as a spinning stone-curved character column which enjoy combining, looking at an instinct with a magnifying glass and so on. Location : Lost River Delta in TDS. The area had ready for use as a vast queue area of the "Sindbad's Storybook Voyage" the attraction since its opening, however this queue area scarcely used as the original purpose. I couldn't tell you the attraction is popular or not, all I can say is this attraction is the one of the shortest waiting time to get the ride. There were once used as an Arabian costumed character's greeting spot. That's where the new attraction "Jasmine's Flying Carpet" is being constructed.. The "Jasmine's Flying Carpet" is a ride attraction which guests can enjoy soaring over the Jasmine's garden and can driving own carpet up to about max. 5 meters from the ground. Also guests can change their carpet tilting back and forth. The other family and the guests not riding the attraction can be seen the flying carpet up close from the deck on the hill. The construction site for the "Toy Story Mania!" is next to the "Broadway Music Theatre", the part of the New York area in American Waterfront. The attraction will be opened in 2012, and the opening date is unknown at this time. Location : American Waterfront in TDS. I guess these fences to ready for the vegetation and decoration of the spring event "Disney's Easter Wonderland". The same event in last year seemed to be built a big success, therefore OLC will step up this event in this year. Officially announced that during this event, there are the special parade "Disney's Easter Wonderland" will be performed twice a day, the Disney characters put on the Easter costume entertain the guest. And during the parade Mickey changes his costume six times! The fence over the shop near the castle in Fantasyland. There were the "Aristocats" the merchandise shop which closed on 10. JAN. 2011. The shop is now under refit as a new shop, "Kingdom Treasure" the merchandise shop. I guess that the shop needed to refurbish more familiar than the theme of the Aristocats and adjust the shop to the new attraction "Cinderella's Fairytale Hall". Inside this shop, various treasure of the kingdom displayed. There are a paintings of Knight Mickey fight with Dragon, and Princess Minnie. And the armor for the Donald and Goofy are displayed too. The guest enjoy their shopping surrounded by many treasures. The various merchandise item will be available such as a soft toy, stationery product, towel, straps for cell phone, and a fun cap. The picture from Cinderella Castle facing Fantasyland. This place was a entrance of the "Cinderella Castle Mystery Tour" the walk-through type attraction. It seems to be used as a entrance of the new attraction, "Cinderella's Fairytale Hall". About the attraction, officially announced that, "Guest can enjoy the Cinderella's story through the pictures and dioramas of the brilliant moments from the story. And also enjoying some enchanting gimmicks.". The background story is, the originator of this attraction is Cinderella herself. She thinks that she would like to share her the happiest story with the guest. Therefore Cinderella decides that open up the castle where she displayed her privately-owned property includes some own paintings and her glass slipper to the guest. Attraction Type : Walk-through Type. The above pictures that were taken before 11. MAR. earthquake, and again, the Tokyo Disney Resort is still closing.